I don't know what it is (the water? ), but the Romanians have a way with films that end up being so intimate, edgy, and subtly done, they almost seem voyeuristic. The region's knack with fly-on-the-wall narratives has been highlighted with The Death of Mr. Lazarescu (2005) and the unforgettable 4 Months, 3 Weeks and 2 Days (2007) - and now it's continued with Child's Pose, an uncompromising look at a destructive parent-child relationship gone awry from director Calin Peter Netzer. All three of these films feature the expressive, hard-edged Romanian actress Luminita Gheroghiu - who gives Child's Pose its heft as a well-intentioned but entitled, supremely selfish woman. 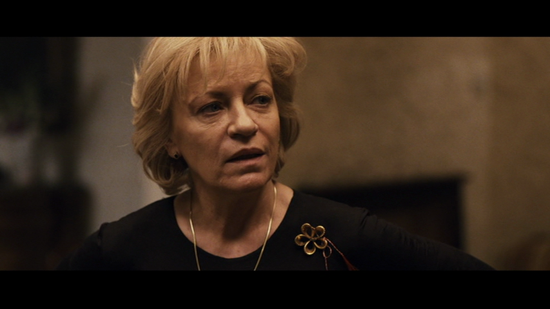 Child's Pose centers on Gheroghiu's affluent, sixty-ish architect Cornelia, who is seen bitterly complaining about her adult son in the film's opening scenes. Cornelia lives in a plush yet insulated world, which annoys her all the more since the aimless man she speaks of, Barbu (Bogdan Dumitrache), desires to have little to do with her. The man is absent from Cornelia's lavish birthday party organized by her husband, Donnul (Florin Zamfirescu), and members of the opera company for which she designed sets. Informed by her sister, Olga (Natasa Raab), that Barbu was arrested for causing an auto accident, Cornelia immediately comes to his aid. This is where it gets interesting - the accident involved the death of a young boy who lived in a lower-class side of town. The haughty, fur-coatted Cornelia arrives at the station to prevent Barbu from going to jail, encouraging him to change the speed of his vehicle on the police report, attempting to bribe the police chief with favors, and (eventually) retrieving the cell phone from Barbu's totalled car on the sly. Although Cornelia comes into the situation out of a motherly need to protect Barbu, in reality it reveals the ugly, controlling side of her, adding a new wrinkle to what was already a contentious and weirdly co-dependent relationship. In the ensuing investigation, she breaks into her Barbu's apartment, pries into her son's intimacy issues with his divorcee girlfriend, Carmen (Ilinca Goia), and does everything she can to pull strings and get her way. While the cowardly, hypochondriac Barbu's first impulse is to move on, Cornelia uses the accident as an excuse to reign her son further into her smothering orbit, done in a low-key and entirely plausible manner. Child's Pose serves as a scathing critique on class disparity, a message which probably resonates better for the Romanian audience. What struck me the most were the fascinating, multi-layered characters - Barbu is kind of a useless underachiever, but one can see where he's coming from in wanting to escape his family's clutches; Cornelia is a deluded control freak, yet even she gets some sympathy for her sincere desire to assist the dead boy's family (although, true to her character, she does it all wrong). A highlight occurs when Cornelia arranges to discuss a possible settlement with a witness to the accident - the driver of the vehicle Barbu was attempting to pass when he killed the child. Played by Vlad Ivanov, memorable as the abortion doctor from 4 Months, 3 Weeks and 2 Days, the character emerges as a cynic who can see right through Cornelia's machinations. Director Calin Peter Netzer fleshes out the caustic screenplay (co-written with Razvan Radulescu) with a subdued tone and realistic, searing performances. Child's Pose netted the prestigious Golden Bear award at the Berlin Film Festival and was the official Romanian selection for the Best Foreign Language Film Academy Award (suprisingly, it didn't make the final nominees). Unlike many award-garnering films which end up being somewhat underwhelming in the end, Child's Pose was well deserving of all the accolades it could get. The Zeitgeist Films DVD edition of Child's Pose presents the film in handsome 2.35:1 widescreen format which preserves the detail and lifelike color of the digital photography. Although many of the film's scenes were shot in low-level light conditions using available sources, the final results end up looking atmospheric and not murky. The disc includes the film's Romanian-language soundtrack in either 5.1 Surround or 2.0 Stereo, an atmospheric mix with solid levels on the dialogue and good, subtle use of ambient sound effects. Optional English subtitles are also provided. Some candid Behind-The-Scenes Footage (10:56) shows the cast and crew having a fun time making the film, despite its glum subject matter. A Deleted Scene (8:28) fills in a bit more info on Cornelia's tough working method and offers a glimpse of Barbu reaching out to the victim's father. The disc also includes a U.S. Theatrical Trailer (1:50). Trailers for other Zeitgeist Films releases round out the bonus content. Mamma mia. For anyone having to deal with an overbearing, control-freak mother, check out actor Luminita Gheroghiu's exquisite performance in Child's Pose and rest easier. Director-screenwriter Calin Peter Netzer's intimate, character-driven piece is a shrewdly observant tale concerning a wealthy, conceited woman's efforts to protect her son after he was involved in an accident. Romania seems to be the place for captivating, hard-hitting contemporary drama; Child's Pose is no exception. Highly Recommended.